Wide egg noodles (or Amish noodles) cooked in broth and butter with a supper easy "walk away" recipe. I love these noodles. Well, I mean, who wouldn't? Hot savory noodles cooked in broth and dripping in butter… um, yeah, roger that! But what I love most about these is how you cook them. Once you boil them for a few minutes, you just put the lid on and walk away. And then you can finish everything else you’re cooking, set the table, fold some laundry, feed the dog and check your email and not have to worry with them. They’re ready when you are. I also like that the recipe makes a big batch because they refrigerate beautifully. I make these once and then serve them twice. We had these as a side dish Sunday and will have the leftovers again tomorrow night. I've also added shredded chicken to the leftovers and called it supper! And I like that you can change up the broth to go with whatever else you’re cooking. I usually use chicken broth but have used both vegetable and beef and all three are fantastic. In a large pot, bring broth, butter, salt and garlic to a full, rolling boil. Add noodles and boil, uncovered, for 5 minutes; stirring occasionally. Taste for salt and add more if desired. Turn off heat, cover and let noodles set for 20-25 minutes or until tender and most of the broth has been absorbed. Stir once or twice the first 10 minutes to make sure the noodles don’t stick to the bottom of the pan. Stir again just before serving. Enjoy! Thanks for a great recipe! I've cooked my wide egg noodles this way for years -the METHOD, anyway, This is an absolutely delicious upgrade to one of my favorite stand-by sides. YUM!! Dang... These sound awesome! I've made buttered egg noodles for years, but never cooked like this. Guess what I will be making this weekend ?! You can leave them on the burner. I have an electric stove too. When I grow up I'm going to get a gas stove. What do you usually serve with these? Oh gosh, just about anything... pork chops, baked chicken, smoked sausage, etc. It's just a good side dish! I'm serving with lamb chops and I think think this time I'll throw a little fresh spinach in the pan for the last 20-25minutes. Thoughts? I'm always up for adding fresh vegetables to anything! Wow. 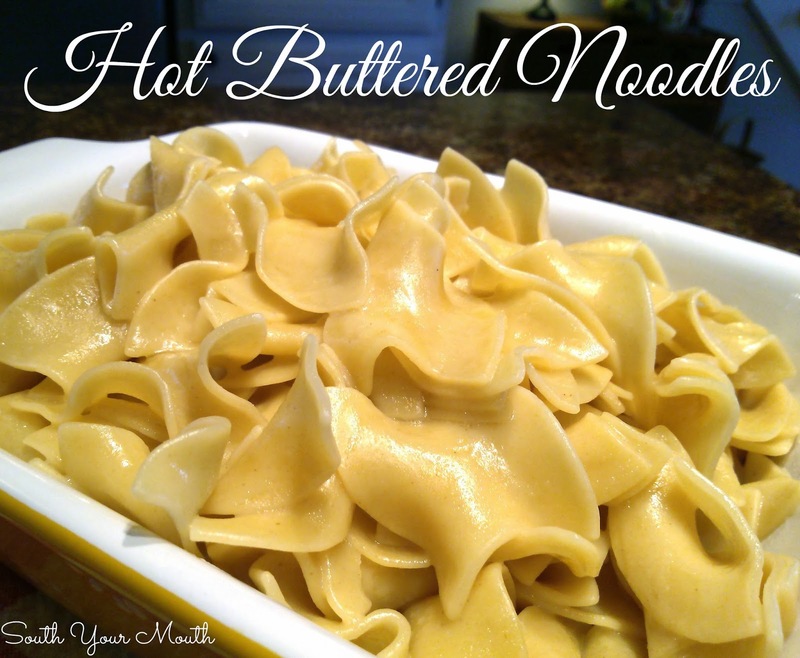 How delicious buttered noodles. I love to savor them . These were delicious; so much better than a packaged side dish. I gotta give you props. this is the only way im cooking pasta from now on. it has worked on bow tie, penne, egg noodles, even spaghetti. it adds so much flavor to pasta that is usually pretty flavorless as it is. i even use boullion cubes instead of boxed broth to bump up the chicken flavor. good job. im hooked on the method. My favorite comfort food! My daughter asks for these as a meal. We always top with Parmesan cheese. We both love to add peas for protein. Also use low or no salt broth. Oh and pepper, tons of pepper! Can anyone tell me if they have ever had any leftovers?? LOL I'm a one-person 2-cat household and would like to try this. Obviously won't be eating all of it in one sitting but wondered what the texture is like after being in the fridge and re-warmed in the micro. Just two of us in our house (and one dog), and I can tell you that we have enjoyed these noodles the next day, warmed in the micro. can you use this recipe with another noodle? I am gluten-free and I'm not sure if there is a gluten-free egg noodle. Was wondering will the noodles be at a good temp to enjoy after sitting that long in the pot? Absolutely! They sit covered, on the burner so they are plenty hot when it's time to eat! These are SO good. No, they are superb! OK, what is better than that? Have shared this recipe with several friends via a link to your website - ALL rave reviews. Love your website. So very many great recipes. I have both of your cookbooks, and they are treasures! Thank you! Just like my Grandmother used to make for us! Yum! I had not tried Egg Noodles by this method, but they turned out REALLY good. Kicks a simple staple up a notch or two. Egg Noodles were a frequent dish in the lean years of college and just married. Brown some smoked sausage, onion and bell peppers and stir into the cooked noodles for a cheap and filling comfort food meal in 15 minutes flat. Could you throw in cream of mushroom soup and hamburger meat? These are THE BEST noodles. Of course, how can you go wrong with a stick of butter?! I've made them with both chicken broth and beef broth -- so delicious. Such a simple side dish but it just raises the bar on the meal. Thank you!